Are you ready to lose some weight or try a clean bulk? Then you're going to need a kitchen overhaul. Don't start your diet without first making sure these items are in your kitchen! If you get most of your calories from restaurant food, you may only use your kitchen to prepare bowls of cold cereal. But I'm guessing you don't look the way you want. Not yet, anyway. Those empty drawers and cabinets won't help you get the body of your dreams. Don't let this space go to waste! Turn your kitchen into a clean-food cooking factory. Grilling is one of the best ways to cook meat-it reduces fat and adds flavor. You might be the king of outdoor grilling, but cold weather and piles of snow can put a damper on your grill sessions. With an indoor grill, you don't have to say "goodbye" to grilled chicken, steak, or fish. Choose a high-quality indoor grill that offers many temperature ranges so you can grill meat, vegetables, potatoes, or even pineapple. Don't let the weather influence how you eat! Protein shakes are a fast and easy way to satisfy your protein needs. With a good blender, you can add fun ingredients like frozen fruit, cottage cheese, or spinach for a tastier muscle-building snack. If you can, buy a blender that doubles as a food processor. It'll provide even more options for your cooking adventures. Cutting meat and vegetables with dull knives is annoying. Do yourself a favor and grab a new set of sharp knives. They'll make meal preparation easier and more efficient. Look for a set that comes with numerous blade sizes and a sharpener. Tenderizing meat before you cook it is a great way to reduce toughness. If you use a tenderizer along with herbs and spices, your meat will have better flavor and better texture. Try it out and see what I mean! This might seem like an obvious one, but having a can opener that works well is a must. There's nothing worse than a crappy opener that leaves you with a mangled can and a half-open lid. Tuna, tomato sauce, and pumpkin puree all come in cans—so make sure you have the proper tool to help you get the nutrition you need. If you're into fitness, you may be cooking in bulk and packing around food. A set of Tupperware containers makes eating clean much easier. Score a set that has multiple sizes so you always have a useable container. Nope, they're not just for your grandma's kitchen anymore! If you like to bake with protein powder, or even make your own salad dressings, you're going to need measuring cups and spoons. 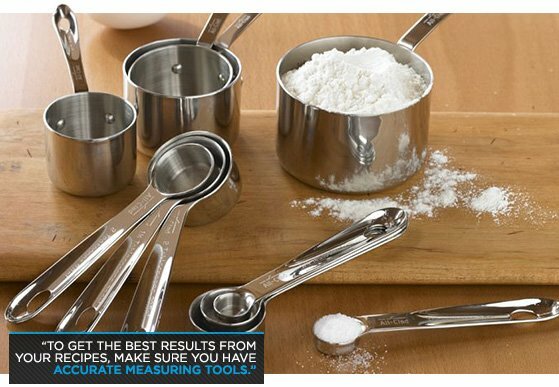 To get the best results from your recipes, make sure you have accurate measuring tools. Misjudge the amounts, and you may like the meal you end up with. If you aim to lose body fat or build muscle mass, keeping track of your calorie intake is going to be vital to your success. If you're not weighing and measuring your serving sizes accurately, meeting that exact calorie requirement may be tough. Many of the high-tech food scales will tell you precisely how many calories are in the food you weigh. These scales make the dieting process much easier.